Take the #1 Trans-Canada Highway to 9th Ave West exit south. This exit is on the extreme west of the city. Follow 9th Ave for several miles, and the Church is on the far south side of the city, past the 9th Ave overpass over the CPR yards. The Church is on the east side of 9th Ave on the corner of Grandview St. BUS: Call to find local bus route information. The bus stop is one block distant from the Church. AIR: One flies to Regina, SK, and then travels by surface 60 km. There is a bus which arrives at the Moose Jaw Bus Depot. Services are in English, and the parish follows the New Calendar. 6:30 PM Vespers followed by Confessions. 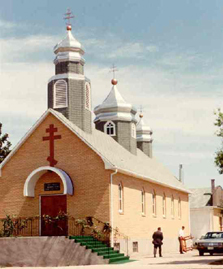 The parish was founded in 1913 by immigrants primarily from the Bukowinian area of Ukraine / Romania, and both served and serves persons of all national backgrounds. For more information, please see the parish’s web site.